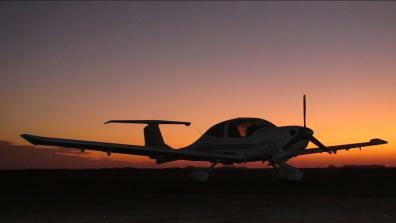 Pancake Airlines wants to share the fun and thrill of flying across Europe with our Diamond DA40 with all other addicts to general aviation. Or by the way with everybody else who is interested in following the images produced during our travels. Our individual trips are described in more detail on www.pancake-airlines.blogspot.com and each trip also contains a link to a High Definition video parked on DailyMotion or Youtube. Ignorant as we are about all technical details, this blog focuses on the actual possibilities and ease of use of modern small airplanes. Even with our limited experience we were already able to fly to quite an number of European countries, with hopefully a lot more to come…. The Pancake Airlines crew started her flight training in 2006 at the Dwarf Powered Gliders flight school at Hilversum Airport in the Netherlands (www.dwarf.nl). 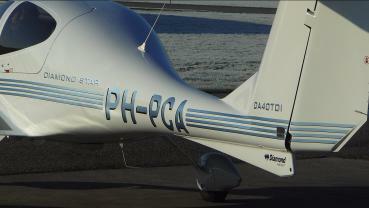 October 2007 Pancake Airlines bought her first airplane via Wings over Holland at Lelystad Airport, a Diamond DA40 (www.diamond-aircraft.at)with registration PH-PCA. Wings (www.wingsoverholland.nl) provided also our PPL and IR training in 2008 and 2009, and is currently arranging the preparation for Marijke’s CPL. Tips and/or photo’s regarding other beautiful airports in Europe? Other suggestions for places we have to visit close to a local airport (e.g. golf, hotel, restaurant that we just have to see) ? Just send us an e-mail and perhaps you’ll see the coverage of your suggestion in no-time on this website. Thanks very much in advance!